Black Lives Matters activists at Dartmouth tore down a #BlueLivesMatter poster display at Dartmouth College showing support for law enforcement and remembering those who lost their lives in the Sept. 11 terrorist attacks. They then posted their own “propaganda” and administrators essentially allowed the vandalism to occur and stay up. The Dartmouth Review chronicled how the The Dartmouth College Republicans underwent a three week process to gain proper approval for the use of a bulletin board in Collis, Dartmouth’s student center. The administration granted approval for a Blue Lives Matter display in honor of National Police Week for a period of two weeks between May 2 and May 15. News spread through social media, prompting some to be angry and refute the support: “In case recent news about inclusivity and diversity had you fooled, Dartmouth is still racist. Located in the student center atrium,” pne person posted. “A group of students, claiming that they were acting independently of one another as to absolve themselves of collective responsibility, removed the College Republicans’ Blue Lives Matter display, replacing it with four flyers that state, ‘You cannot co-opt the movement against state violence to memorialize its perpetrators. #blacklivesmatter. '” the Review summarized. The Black Lives Matter flyers were then posted all around, throughout Collis. In the article, the photos and assertions is that the students looked on to ensure the Blue Lives Matter display wasn’t restored. On Friday, May 13 at approximately 11:00 a.m., a group of students removed our Blue Lives Matter display in Collis in honor of National Police Week. As an organization, we took the time and effort to obtain proper approval for the display while putting significant thought into its content. We are dismayed that a group of students would attempt to censor our message while coopting the space for their own purposes. We had hoped to bring attention to law enforcement officers and their efforts and hard work in keeping our communities safe. In particular, we had hoped to honor all the law enforcement officers who have given their lives in service to their communities. Just this morning, in Manchester, New Hampshire, two police officers were shot. Thankfully, both are expected to recover. However, this most recent incident only underscores the challenges facing law enforcement officers everywhere; just this year, 35 law enforcement officers were killed in the line of duty across the United States. We hope that the Dartmouth community and the United States at large join us in appreciation of the challenging work that law enforcement officers perform. We have reclaimed the board. We are reclaiming our space, in Collis, in Class, and on this Campus. We have proclaimed “Black Lives Matter”—we do in fact matter, and we are here. F*** your comfort, there is no such thing as neutral existence. Sitting in the library with your headphones in, intensifies this violence against people of color, muting the voices of the movement, the cries of your peers, and the history of inequality. Posting Blue Lives Matter reproduces the idea that All lives matter, again intensifying the violence against people of color. Invalidating individual realities. We occupy this space, in front of the bulletin board, to guarantee our presence at this institution. Reposting Blue Lives Matter reproduces this violent narrative against people of color, by silencing us. We will not be silenced. The administration should grow a pair and take action against these students. Expel them and let them find another place to study. Perhaps an all black school would suit them better. 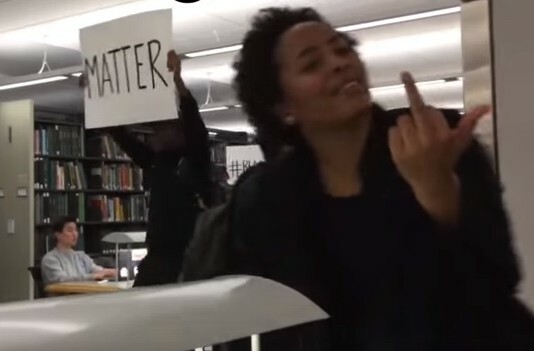 The BlackLivesMatter group at Dartmouth are nothing more than ignorant, intolerant, totalitarian thugs. Frankly, they should be identified, and their entire college transcripts zeroed out and forced to start over from scratch, as they haven’t learned the first thing about freedom, independence, responsibility, or democracy. The person with the sign, and the female with the middle finger, merely show that they think nobody else’s lives matter except their own. A more racist, self-centered, narcissism you’ll not find. It seems that some black lives matter only to suppress others views.